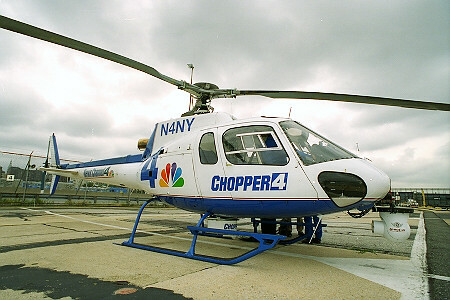 New York - The station, which launched its helicopter coverage in 1995, and was the first in town with one, is now sharing chopper services with WNYW/Ch. 5. “It’s been tough, I never though there’d be a day when I wouldn’t be in the air,” Dan Rice, Ch. 4’s former chopper correspondent, told the Daily News. Rice, who is married to Ch. 7’s chopper ace Shannon Sohn, told The News he’d learned he would lose his job in March, just after winning an Emmy Award for his chopper coverage of a crane collapse in Manhattan. Thursday was his last day. Ch. 4 had also been first over the crash of US Airways Flight 1549 in the Hudson River, which helped the station gain an early competitive edge on the coverage. The joint effort between the two stations expected for some time. As first reported here in March, the stations started testing sharing one chopper during coverage of the Bernard Madoff court case. And, in the past two weeks, Ch. 4 viewers in the morning have heard the voice of Ch. 5’s Kai Simonsen from the station’s SkyFox helicopter. Cutting out one of the choppers and sharing the costs can shave $500,000 a year from the budgets of each station. WCBS, Ch. 4 and Ch. 5 all lease their choppers and crews from the same company. In Ch. 4’s case, it is yet the latest step in belt tightening and a change in approach that has also seen the departures of on-air staffers Jay DeDapper, Carolyn Gusoff, Carol Anne Riddell, Otis Livingston, Monica Morales, Kendra Farn, Len Berman and SallyAnn Mosey. The station also closed its Westchester bureau and, according to sources, eliminating the use of freelance photographers. At the same time, the station has launched a $15 million digital newsroom, once called a “content center,” and created a critically lambasted channel New York Nonstop. Ch. 4 is not alone in making cuts, but none has gone deeper than the NBC owned outlet. For instance, WABC/Ch. 7 this week cut bureau chiefs at its bureaus outside of the city. And Ch. 2, last year made cuts, and this year dropped sportscasters Ducis Rodgers and John Discepolo. Ch. 11 has cut a handful of off-air staffers and could trim more, while WWOR/Ch. 9 is expected to make what could be deep cuts from its production staff before summer. When Ch. 4 launched its chopper in 1995, other stations immediately took notice and followed suit, making helicopters a standard part of local news coverage. People just don't want to watch talking air-heads who ALL report the same liberal bias. Its boring and there are many choices. One of the reasons FOX news is popular is that they are different (except in NY Ch 5). Thank you hashem for groundning this helicopter and hopefully you will ground the others. What an absolute waste of money, gasoline, and they make so much noise, especially when they hover over your house for 40 min at 6 AM so they can show traffic pictures. Isnt it enough if I tell you there is traffic on the BQE-do we need pictures of it too?